Today is the day to eat all of the strawberry ice cream you want and NOT feel guilty! (Ok, maybe just a little ) But it is the day to celebrate! January 15th is national strawberry ice cream day...also national hat day, so throw on your favorite topper while you chow down! Fun fact for you; Dating back to at least 1813, strawberry ice cream was served at the second inauguration of James Madison. Preheat oven to 180°C/350°f. Grease a 22 cm/9 inch round cake pan. Melt the butter in a large GreenPan sauce pan over low/ low-medium heat. Add the chocolate, sugar and 1 cup cold water. Stir consistently until smooth (about 5 minutes). Let cool for about 10 minutes. Add the eggs, flours and cocoa. Stir until smooth. 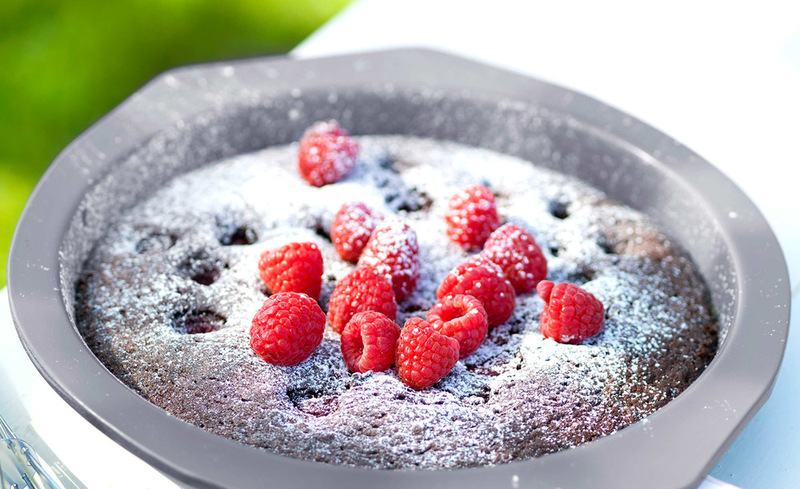 Pour mixture into the cake pan, adding fresh berries into the mix. Bake for about 1 hour (test by pricking with a toothpick, if it comes out clean its done!) Serve with additional fresh berries and strawberry ice cream.